Brian is a creative based, strategy skewed and business minded lead of MullenLowe Profero Shanghai. Since 2003, Brian has worked at integrated agencies in Malaysia, Singapore and now in Shanghai for the past 6 years with Profero. From global, regional and local rollouts, he’s worked on all forms of digital engagement from mobile apps, microsites, social media programs on ground installations etc. for clients like BMW, MINI, DFS, Fairmont, Nokia, Nike, Toyota, Coke, Fiat etc. 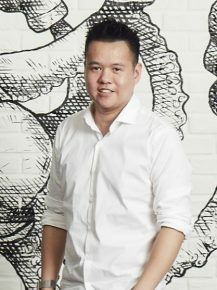 His drive to make work more meaningful for the target has resulted in recognition at New York Fest, Spikes Asia, Asia Interactive, Singapore Hall of Fame, Kancils, DMA, DMAM. He’s won the Effie in Singapore, Malaysia and also in China. He’s also on CampaignAsia Digital A-List and “40 under 40” in 2016 and a Startup Weekend Shanghai 1st Place Winner.